Graphite Lab’s Hive Jump is a multiplayer co-op shooter where soldiers must descend into a procedurally generated alien hive. 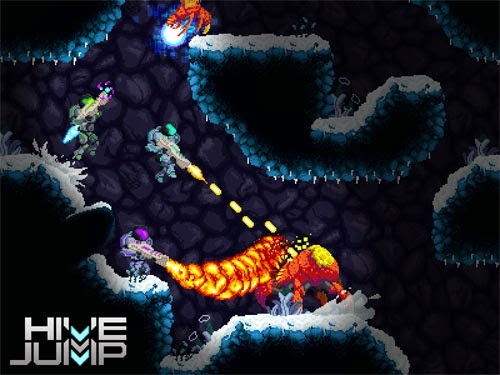 Players work together to blast hordes of slime-spitting bugs with pulse rifles, flamethrowers, and bombs, all of which are upgradeable by gathering resources from within the hive. Players are able to move and aim independently to deliver maximum destruction, and jump boots allow them to soar over critters and aim downward to give them free hot lead acupuncture treatments. At the bottom awaits the hive queen, and the crew has a nasty surprise for her, as they plant a transporter beacon that allows their orbiting ship to beam a nuke right into mommy’s lap. Hive Jump is now available for PC, Mac, and Linux via Steam and is planned for a Wii U release later this year.